In 1207 Alnmouth (known at the time as St Waleric) was such a prosperous fishing harbour that it was given the status of borough and granted a charter to have a weekly market. It continued to prosper over the years providing a harbour for ships engaged in foreign trade as well as local fishing boats. In 1316 and 1326 the bailiff was ordered to provide vessels suitably equipped for a military expedition to Gascony. All ships over 30 tons were requisitioned for the defence of the Kingdom. In 1348 the Black Death reached Alnmouth, probably on one of the trading ships, wiping out a third of the population. At that time England and Scotland were fighting for possession of Northumberland, and these two events caused Alnmouth to be almost destroyed by the middle of the 14th century. Slowly it began to recover and by the 15th century improvements were made to the harbour and ships were once again exporting wool, coal and other produce. In 1606, after the Union of the Crowns of England and Scotland, the borders became peaceful once more. In the late 17th and in the 18th century Alnmouth prospered again. Fishing was still important, but there were also topsail schooners and brigs sailing to Newcastle and London, Berwick and Edinburgh and across to Scandinavia and Holland. The expansion of the British economy in the 1750s contributed to Alnmouth’s prosperity. Northumbrian grain was transported to Alnmouth and stored in large granaries. Many of these still survive. In July 1771 ten vessels sailed from the port with grain. On 8 July the Isabella and the Janet sailed for Leith with 72 tons of oats. On the same day the Hopewell and Providence arrived from London with a mixed cargo of fullers earth, saltpetre, tin plate, tea, sugar, lemons, rum and beer. On Christmas Day in 1806 during a great storm the river changed course to the north of Church Hill. 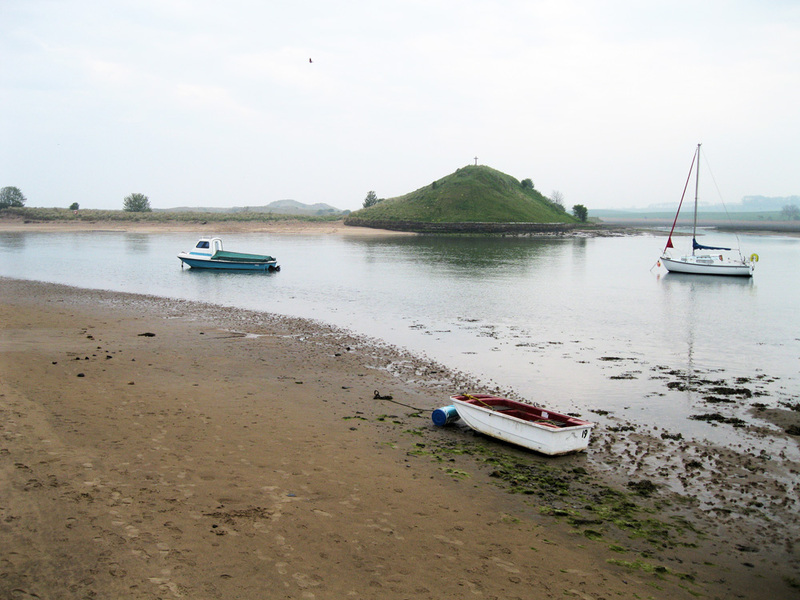 This proved disastrous for Alnmouth because the ships found it increasingly difficult to enter the harbour, and eventually Alnmouth fell into a decline. The last commercial vessel, the Joanna, sailed from Alnmouth in 1896. The Joanna was a brigantine which generally carried Scandinavian timber into the port for use at the nearby Waterside House saw-mill. The advent of the railway in the mid 19th century nearly finished Alnmouth, providing easy and quick transport between Edinburgh and London. However, the railway, which was thought to be such a disaster for Alnmouth, became its salvation. The Victorians came to love Alnmouth as a holiday destination; it became fashionable to gather at the estuary in the evenings, to take warm sea-water baths and to play golf. After World War II Alnmouth once again became a holiday destination. Visitors return annually, and the river estuary, once a busy port, is now home to pleasure craft and small fishing vessels.